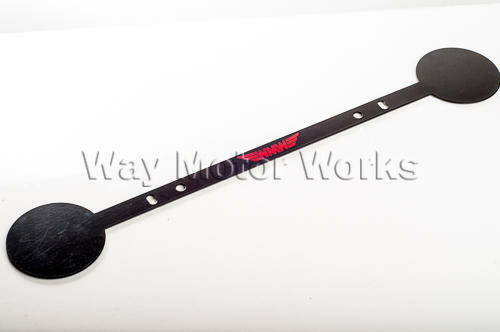 This WMW Grill badge holder can be used on the boot, or the front license plate. On the boot, you have two available positions. It can be attached using the two existing screws that hold the license plate bracket to the boot, or the two bottom screws that hold the plate to the bracket. On the standard MINI front mount, you have also have two available positions, the top of the plate, or the bottom of the plate. On some aftermarket license plate brackets, you have a center mounting option as well. Display your prized badge collection on the boot of your Mini, were other Motorers can see them. This unique badge holder is Laser cut from high grade steel, Powder Coated, and very Durable. It allows you to display more of your badges, and can free up your grille for driving lights. A perfect fit for all 3" magnetic badges, and works with all hatch mounted plate holders. Installs with ONLY a Phillips head screw driver.